This feature is not available for Yearly Package subscriber. This feature is available only for Advance Package. 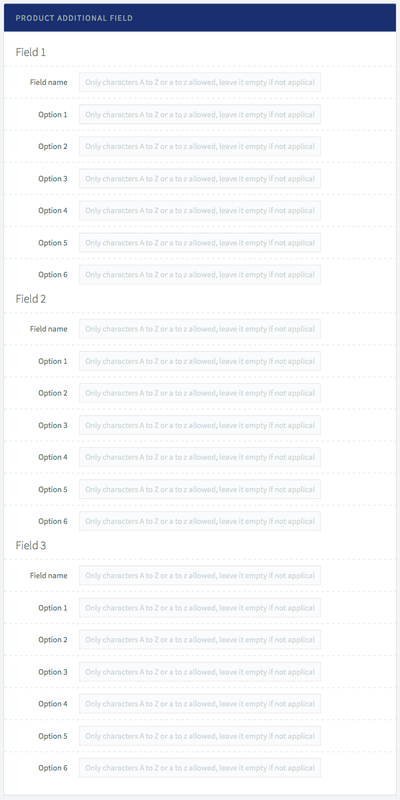 This feature allows you to add 3 additional fields in the Payment Form. Which means, you can get more input from your customer, or you can offer more selections to your customer. Below is the screenshot of a Payment Form that is without additional custom field. 1. Merchant can add up to 3 additional custom fields. 2. The fields can either be dropdown or text field. 3. For dropdown, we only allow a maximum of 6 options. 3. Select one of your products. Click on the product name. 5. Now, on the “Product Additional Field,” insert your preferred field. 7. Go back to the product page and and check your Payment Form. You should see the additional field in your Payment Form. 1. You can either add 1, 2 or maximum of 3 additional fields. 2. If you just want to use as input field, leave the option space blank. 3. If you want to use the additional field as dropdown, insert the option values. 4. The option value is not necessarily to be filled until 6. 5. The value is alphanumeric (A – Z and 0 – 9). 1. All additional fields will capture the data and display them on your Dashboard. 2. When customer made a payment you will be able to see the value entered or chosen in the transaction detail page.